During the first ten years of married life, we moved four times, which helped to keep our material possessions to a minimum. For the past second ten years, however, we’ve lived in the same house and increased our family to five in number. At the same time, both sets of parents have “de-cluttered” their houses as they’ve moved into smaller places, which has resulted in our home becoming substantially more full. As a result I’ve become a bit of a manic freak about getting rid of stuff. Every six months the children and I go through their books and their toys to donate to organizations which help needy children. Every summer for the past few years, I’ve gone through the continually growing pile of “stuff” in the basement to donate to organizations like the Epilepsy foundation who so wonderfully come to your house and pick up anything and everything you’re willing to donate for them to sell at discount prices. Even as I write, my youngest is delightfully planning the yard/garage sale I told him we’re going to try to do this summer to rid ourselves of even more “stuff”, all of which are great and wonderful items to have but which we ourselves no longer need. In the heat of the “purger”, however, there are a handful of items which I will never, ever part with or give away. Those are my few cooking extravagances which I use almost every day. My slow cookers I’ve already written about, but just as a reminder: Crockpots are a godsend for getting dinner on the table when life is crazy. The second item is my Kitchen Aid which I’m still grateful to my in-laws for purchasing as a Christmas present the first year I was married after I mixed up several dozen batches of cookie dough by hand and couldn’t use my right arm for a week after! The final item which I use all the time and which I would highly recommend to anyone and everyone who wants to cook at all is my food processor. I’m not talking about one of those large ones which department store wedding registries try to sell you and which seem to have a bad rap for being big, bulky, and hard to clean. I’m referring to a simple small four cup food processor which you can find at a second hand store for a few bucks and which is more than adequate for any family use. If you do any cooking at all, you’ll know that so much of the time consumption is the chopping and preparation. The beauty of the food processor is that it does all your chopping, shredding, and more while you’re working on something else. It also chops and cuts and shreds more uniformly than you’ll ever be able to do, which helps for even cooking. Finally, it can perform tasks such as grinding nuts and whole oats into flour which is truly wonderful if you’re always having to substitute different foods into your cooking and baking due to food allergies or dietary restrictions. 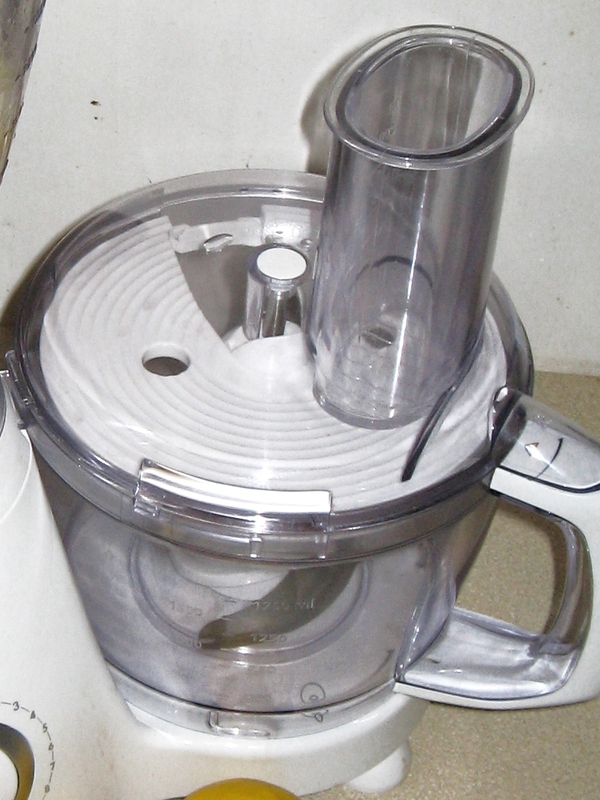 I use my food processor several times a week for almost all my cooking but there are specific recipes for which I’m really grateful to have such a tool on hand. Below are two such recipes. 1. In the food processor chop the peaches to the size and consistency you like for your salsa. (Some folks prefer their salsa chunky while others like it pureed. I tend to make mine somewhere in the middle.) Pour into a bowl. 2. In the food processor chop the diced tomatoes with the onions, garlic, lime juice, and cilantro. Add to the peaches in the bowl and stir well. Set aside or put into the fridge so the flavors can meld. 3. Season with the black pepper and salt, if using. 4. Over medium heat, melt the butter with the olive oil in a pan that will fit your salmon fillets. 5. Carefully place the fillets into the hot pan, and cook for five minutes. It’s best that you just leave the salmons alone to form a nice browned crust. 6. Flip the salmon over and cook for two minutes to finish. 7. Place the salmon on plates with the crust side up and spoon peach salsa over the top. * If you’re using the frozen peaches, you can simply pull them from the freezer, dump them into a microwave safe bowl and defrost for one to two minutes, just until they’re not frozen solid. If you’re thinking ahead of time, you can pull them out a few hours before and defrost them in the fridge. If you’re using fresh, you need to slice the peaches off the core. ** I like to buy wild caught frozen salmon because it’s cheaper, and then it’s ready whenever I need it. If you’re thinking ahead, you can put the salmon into the fridge the night before to defrost. If you’re like me and only thinking of dinner at the last minute, simply the salmon in their packages into a bowl of cold water for twenty minutes, turning them halfway through the time. Then remove them from their packaging, rinse, and pat dry.